A regional newspaper has changed its publication frequency for the third time in six years as a sister daily launches a new edition on its patch. 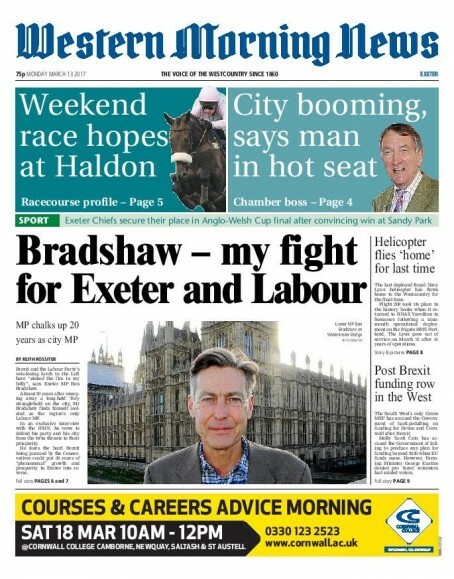 The Exeter Express & Echo’s Monday edition has ceased publication following the launch of the new Exeter edition of the Western Morning News. The Express & Echo had been bi-weekly since February 2015, running Monday and Thursday editions, having switched from daily to weekly before that in 2011. The last Monday edition of the Express & Echo was published on 6 March, while the first Exeter edition of the WMN came out on Monday. The change comes two weeks after Trinity Mirror, which owns both titles, announced a restructure of its Devon operation which saw editors in the county switch roles. Torquay Herald Express editor Jim Parker has also taken on the role of print editor for the Express & Echo, the North Devon Journal and the Mid Devon Gazette series, while Patrick Phelvin, who was previously editor of the Express & Echo and Gazette, is now editor of TM’s countywide Devon Live news website. The site has replaced the online arms of the four newspapers now under Jim’s control. In an announcement about the latest changes, Jim told readers the new-look Thursday Express & Echo would feature more news, puzzles, comment and analysis. He said: “We’ve been putting a lot of thought and effort into producing a bigger and better weekly edition of the Express & Echo which will include the latest news, features and sport in addition to motors and property. Bill Martin, editor of the Plymouth-based WMN, added: ““We launched our new Devon-wide website, Devonlive.com, which is based in Exeter, last month, and we wanted to complement our offer in the city with a daily print product. “With huge investment and a rising population, Exeter is generating a huge amount of news these days, it has a burgeoning business community and is becoming regionally more important. Although not quite the case here from how I undetstand it, Moving an ailing daily title to a once a week weekly or converting a paid for to a free title is the way ahead, even if on a last roll of the dice basis which other publishers would do well to adopt. To continue pumping money and associated costs into producing daily papers which have lost their audiences and readership bases make no sense whatsoever. Similarly moving dire weekly paid for papers to frees would also be a more financially viable option as the copies sold these days is so poor as to hardly make any dent in terms of lost cover price revenues, indeed with a greater audience seeing the papers the ad reps would have a far stronger sales proposition to sell to. I believe every publisher and financial chief needs to look at their entire portfolio of titles and take decisions along the lines taken here or as SSJ says in his comment. I just wonder how many more big bold ABC sales figure losses some titles must endure before someone with sense takes the decision, without sentiment to long established titles to act.this isn’t a psssing phase as many dyed in the wool managers filled themsrlces into thinking it was, this is the reality, and the reality is doing nothing is no longer an option. Yet another editor and a long goodbye from the last one. Good to see they put the Monday edition out of its misery – a bad idea in the first place but then another previous ed at the time should have spotted this. A twice weekly published on a Wednesday and a Saturday may have fared better and been more logical but market research never seems to be a priority. And if the weekly hadn’t have been such a dog’s dinner in the first place, created by another ex-ed now posing as a local media guru, then I dare say it may have had a brighter future. The hokey-cokey style of a management. No mention of redundo. That is a surprise from TM. It’s normally redundo first as Plan A, with more redundo as Plan B. With some evening/morning papers that once sold 100,000-plus a DAY now selling about10,000 going weekly must be the way forward, sad though it will be to see the end of the evening/evening papers.